Nabla is an algorithmic differentiator for mathematical functions. into another java object that in addition to computing the value of value like the original one also computes its derivative. The created object is built by applying the classical exact differentiation rules to the function underlying expressions. There are no approximations and no step sizes. The derivative instance remains tightly bound to the base instance (which is refered to as its primitive) throughout its lifetime. If the internal state of the primitive instance is mutated after Nabla has performed the transformation, the already created derivative instance which is bound to its primitive will use this mutated state for its computation automatically. The following example should explain better what Nabla can do. 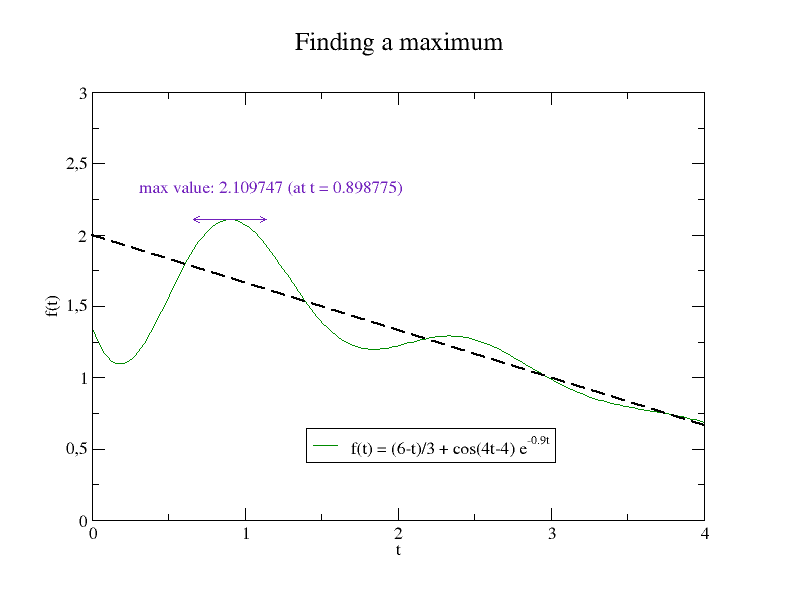 The maximal value is reached when the first derivative of the function is equal to zero. So we need to compute the first derivative f'(t) and find its roots. Nabla will help in the first part: computing f'(t). The derivative object implements the Apache Commons Math UnivariateDifferentiableFunction interface which means it provides a method value which is an enhanced version of the value method of the original function object: it computes both the value and the partial derivatives of the function. The example above shows that Nabla creates an object that computes both the value and the derivative of a function, given only an instance of a class that computes the primitive function. Despite we had the source code available in this case, it was not used: transformation is done at runtime using only an instance of the primitive function. We can also observe that there is no configuration at all: the algorithmic differentiator is built using a no-argument constructor and the differentiation method has only the primitive object as a parameter. instantiating the generated class to create the derivative object. This works for any pure Java function, or more generally for any program using the Java platform as its execution environment. The main drawback of this approach is that functions that call native code cannot be handled. For these functions, a fallback method is to uses finite differences using the Apache Commons Math library. This fallback method does not have the same advantages as the previous one: it needs configuration (number of points and step size), it is not exact, it is more computation intensive and it cannot be used too close to domain boundaries.